Just Mango Slices – The only ingredient in this snack is just as the label reads, just mango. This dried fruit satisfies my intense sweet tooth and is legitimately so good! You can also feel good about this snack knowing that mango contains Iron, Vitamin E, and Calcium! Zesty Nacho Kale Chips – Ok, so they don’t realllllly taste like my beloved nachos but they are still super tasty. This variety also happens to be vegan and gluten free. It definitely satisfies the chip craving and these are baked at such a low temperature that they are actually considered raw, which means that they maintain all of their enzymes! Each serving has six grams of protein and three grams of fiber. See what I mean about the cute packaging? I’m a sucker for it! 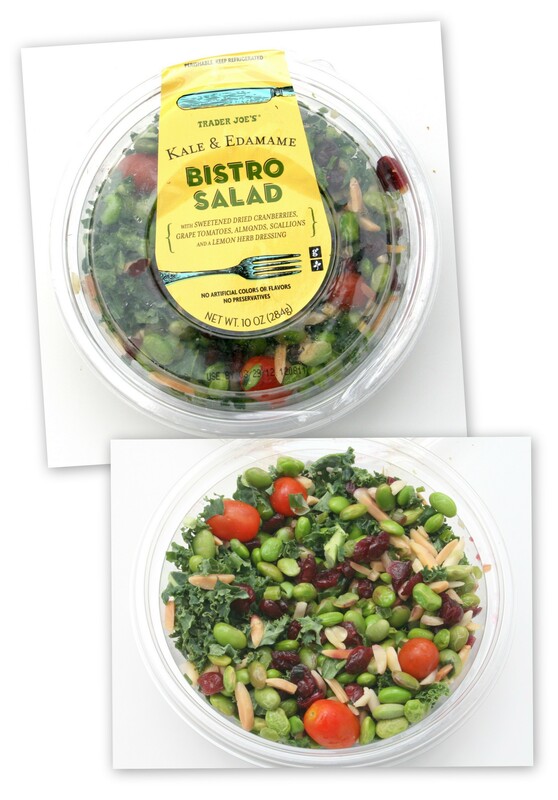 Kale and Edamame Bistro Salad – I know, I know I’m obsessed with kale right now but why shouldn’t I be? It has the highest nutrient density rating, so you’re getting a lot of health benefit in something that is very pocketbook friendly! I usually prefer to make my own salads, but ain’t nobody (me) got time for that right now, so this is a delicious option to the tune of $3.99! This entry was posted in Food, Health and Beauty, Hipster/Beauty Queen Ramblings and tagged Calcium, Dried Mango Slices, Iron, Kale Bistro Salad, Kale Chips, Kids with mohawks, Miss USA Fan Vote, Nutrient Density Index, OPTX Eyewear, Trader Joe's, Vitamin E on May 17, 2013 by Brenna.